A Clone Scout Trooper, also referred to as a Kashyyyk Trooper, an Elite Corps Clone Trooper, or a Swamp Trooper, is a Star Wars Episode III - Revenge of the Sith minifigure introduced in 2005. The Clone Scout Trooper has a unique helmet identical to that of the Scout Trooper, except in sand green. The helmet has flat brim above the visor that also, at right angles, runs down either side, shielding and protecting the eyes. The mouth area is roughly triangular and juts out to accommodate the "nose" and the breathe filter. The helmet, instead of a coming with a black visor, has an opening in the shape of the visor. When placed on the black head the minifigure comes with, it gives the authentic effect of a visor indented slightly. Because of this, one does not have to turn the head as well as the helmet when angling the direction of the troopers gaze. The Scout Trooper has a grey torso that has printing on his chest of camouflage armour, with belts of supplies and survival packs over the stomach region. The arms are sand green with black hands. The legs are grey with printing of a plate that covers the groin and a supplies packet on each thigh. The sand green hip joint sports printing of a black and grey belt. Despite the intricate details of this minifigure on the front of the torso and legs, there is no back printing. 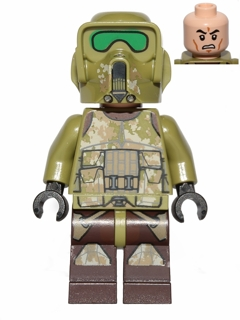 A redesigned Clone Scout Trooper was included in the 2013 set 75035 Kashyyyk Troopers. The figure is of a similar design as the first variant, but has a brighter colour with a camouflage design with dark brown legs. Clone Scout Troopers were Clone Troopers that were deployed on planets with rough or dangerous terrain, dense jungles and forests or dangerous indigenous life. They wore less armour than normal troopers, allowing for more agility and speed but also making them more vulnerable to attacks. These troopers wore camouflage armour which would help them to blend in to forest or swamp worlds so that they could move unseen or surprise their enemies. They were trained to a higher degree than ordinary troopers and carried several supplies and ration packs. These troopers were able to survive weeks in hostile environments without contact from their seniors or ships. This elite training made them ideal for scouting missions and stakeouts. Scout Trooper helmets were designed so that the troopers had a wider field of vision and had enhanced breathe filters for harsh atmospheres. They wore combat boots that grip the ground, making it easier to stay in one spot or move with precision. Scout troopers were often assigned two types of vehicles- BARC speeders and AT-APs. A unit of clone scout troopers in the 41st Elite Corps was present during the Battle of Kashyyyk, under the command of Senior Clone Commander Gree. Jedi Masters Luminara Unduli and Quinlan Vos also commanded a group of these troopers during the same battle in an effort to defeat Trandoshan slavers. After the formation of the Galactic Empire, these units eventually became Imperial Scout Troopers. This is a description taken from LEGO.com. Please do not modify it. (visit this item's product page) During the Clone Wars, the 41st Elite Corps is made up of some of the best and most highly-trained clone troopers in the Grand Army of the Republic. Under the leadership of Jedi General Luminara Unduli, Clone Commander Gree, and occasionally even Yoda himself, these soldiers fight the droid forces of the Separatists on some of the harshest and most remote worlds in the galaxy. Facts about "Clone Scout Trooper"
This page was last edited on 29 September 2016, at 22:05.